In this tutorial, I will show you how to create a drop-down filter in Excel so that you can extract data based on the selection from the drop-down. As shown in the pic below, I have a created a drop-down list with country names. As soon as I select any country from the drop-down, the data for that country gets extracted to the right. Note that as soon as I select India from the drop-down filter, all the records for India are extracted. Create a Unique list of items. Add a drop-down filter to display these unique items. 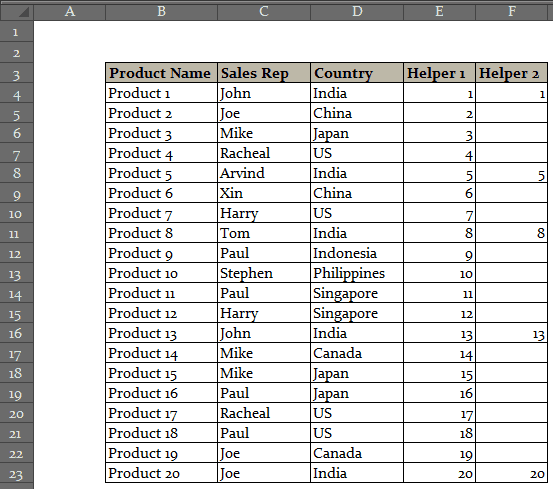 Use helper columns to extract the records for the selected item. Let’s deep dive and see what needs to be done in each of these steps. While there could be repetitions of an item in your dataset, we need unique item names so that we can create a drop down filter using it. In the above example, the first step is to get the unique list of all the countries. Select all the Countries and paste it at some other part of the worksheet. Go to Data –> Remove Duplicates. In the Remove Duplicates dialogue box, select the column where you have the list of countries. This will give you a unique list as shown below. Now we will use this unique list to create the drop-down list. See Also: The Ultimate Guide to Find and Remove Duplicates in Excel. Go to Data –> Data Validation. In Data Validation dialogue box, select the Settings tab. In Settings tab, select “List” in the drop down, and in ‘Source’ field, select the unique list of countries that we generated. The goal now is to select any country from the drop-down list, and that should give us the list of records for the country. To do this, we would need to use helper columns and formulas. As soon as you make the selection from the drop down, you need Excel to automatically identify the records that belong to that selected item. This can be done using three helper columns. Helper Column #1 – Enter the serial number for all the records (20 in this case, you can use ROWS() function to do this). This formula checks whether the country in the first row matches the one in the drop down menu. So if I select India, It checks whether the first row has India as the country or not. If it’s True, it returns that row number, else it returns blank (“”). Now when we select any country, only those row numbers are displayed (in the second helper column) which has the selected country in it. (For example, if India is selected, then it will look like the pic below). You can now hide the original data if you want. Also, you can have the original data and extracted data in two different worksheets as well. Go ahead. use this technique, and impress your boss and colleagues (a little show-off is never a bad thing). Did you like the tutorial? Let me know your thoughts in the comments section. Dynamic Excel Filter – Extract Data as you type. Dynamic Search in Excel Using Conditional Formatting. Create Dynamic Drop Down with Search Suggestions. How to Extract a Substring in Excel Using Formulas. How to Filter Cells with Bold Font Formatting in Excel. V. Helpful and just what I was looking for. One question: if, using your example, the sales reps covered multiple countries how could you filter in that case? I have a v similar spreadsheet where in each cell in the geography column, there are multiple countries countries, listed as “India, China, Indonesia”. I need to be able to filter by one country. Would there be a way of filtering by country without delimiting the countries into separate cells? Thanks!! 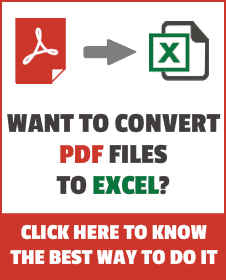 Hii..Very helpful excel functionalities..The steps helped me to develop a report completely. Hi! Thanks for sharing this, really helpful. Also, if I have to create three unique drop-down lists and pull data from source sheet automatically based on the drop-down selection. Say have data by industry, by geography and by month, now need to pull information by a combination of this 3 filters from unique drop-down lists. Can you help? Almost exactly what I’ve been looking for. Thank you. If i wanted a drop down menu for Geography and product name? Hi Guys, I’m stumped with this one. I’m using the following formula to get the helper 3 coloumn. It works fine for a small array of 1000 rows, but when I increase it to 10,000 for example…. it returns BLANK? – Any Ideas? Hi Guys, I’m stumped with this one. I’m using the following formula in column E to return the row numbers of the name I’ve selected in column A, to get the helper 3 bit. It works fine for a small array of 1000 rows, but when I increase it to 10,000 for example…. it returns BLANK? – Any Ideas? HI, nice tutorial, but i was made for 3 column, what if i have around 12 columns, how many helper i will create? Hello, How would the formula change on the helper columns if I’m trying to extract several columns of data. For example if I need 6 columns extracted would I need 6 helpers columns and what formulas would change? Helper column is not how many columns of data you are extracting rather they are there to help finding row numbers from the data needs to be extracted. Hello! is it possible for the drop down list to be multiple selection? how do i extract multiple data if i have more than one selection from the list? Hi, thank you for this! I just have one more question, what if i want to add one more column after sales rep column, what is the formula for that? Do you know how to do this through Google Sheets? Does this pull from multiple sheets? I’d like to get a drop down to reference several sheets of values on the last page so people can see all the data relative to their names and save searching time, but there are multiple sheets worth of data to track, and compiling them into one document makes my work significantly harder. Can anyone please help me with the below query? Hope you can help me with this..
IS this able to be done in Google Sheets? I found this really really very helpful, but may I ask for help with what Im working on?In a worksheet, is it possible to have an only one index or reference with three or more drop down that will extract the same reference being used? Hi! this is so great thanks! Is there a way I can add one more drop down list criteria? So for example in your tutorial. I select India and get data extracted for India, but what if i want India AND only sales rep Joe. SO i would have a drop down list for India and another drop down list to just look at sales rep Joes stuff? How can i also incorporate ALL meaning just show me ALL for country and ALL for sales rep? Can we extract the data from multiple drop-down selection? OK…could you share an example please? Can I have an excel sheet with all the data from the drop down selections on it without the drop down? Hi, if one product is shared by two countries how can I filter that ? Request you to please share same process in VBA code. Thank you so much for your explanation, it is great! I am using a file which doesn’t bring country list; however, brings some information other spreadsheet. Anyway it is not working, the “helper 3” brings the information, but doesn’t show up on “Product name or Sales Rep” and I do not know what I made wrong. greetings trump excel.com it is great platform to learn best excel warm greetings and thanks to all excel bestie’s here in this list….m here suppose to ask question but i see lawre*** has already ask the same question question thanks to Mr. sumit bansal for great help!!!!! has already been answered in the comments). Thanks a lot, this is amazing! Hi if I want to add a row into the data like example I want to insert an additional product between product 14 and product 15, the helpers do not update automatically. What can I do to make the helpers update automatically when a row is added / deleted? So that the extracted data on the right shows the new data? Once you have inserted a new row, click on the first cell of each column. When you click on the cell you will see a small black square at the bottom right. Click on it and drag it down. Do it for all the columns. I’m trying to make a excel sheet with product information witch can sort out and display products witch match certain criteria. Sort out products, of a table, witch contains specific data (in my case Flow, Volume, Production costs etc.). My goal is to have a worksheet with my company’s old work (I work with water cleaning systems) and with this worksheet sort out all the water cleaning systems witch match my search, and display those in some way. And then automaticly calculate a price based on those. I want to able to have multiple drop downs to make my search narrower. I have tried slicers but i can’t get it to work and display multiple matches. Maybe it’s easier with drop down lists? Hello Erik.. It would be helpful if you could share a sample data file. Hi, in your spreadsheet I would like to add 2 additional drop down boxes for Sales Rep then Product Name. I want each drop down to be dependent on the first drop down boxes criteria. How can I make this possible? Great tutorial!! These lessons keep opening new ideas for existing files I work with to make them better. I do need to manipulate the data from this lesson once more. I have a database that lists as columns: First name, Last name Floor, Cubicle, Job Position, Training Date, Equipment issued, issued date. When data is entered I have drop down menus for Job position and Equipment issued. Multiple equipment can be issued to the same person which creates blank cells in the other columns until another name is entered. On the next sheet I have the sort by drop down list as mentioned above. I have successfully implemented it and even get the blank lines to be ignored. However, I need that sorted table, or the first one, to be listed alphabetically by LAST NAME automatically. I cannot sort the first database by last name as the blank lines will not properly adjust with the associated name. Basically I need to sort alphabetically Helper column 3 from above or the main database taking in to account the blank cells. 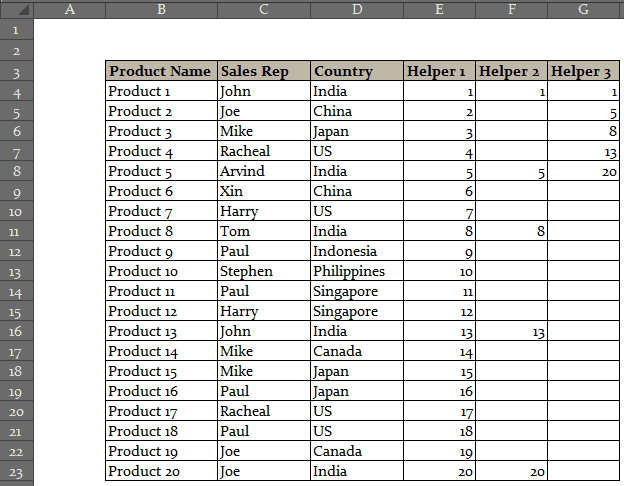 Hi….Is there is possibility to Add more 3 or 4 columns along with Product Name, Sales Representative and Geography ?. If, Yes, Kindly request you please add 4 columns. Waiting for your new editions. I guess my question would be how can I get the drop down for months(setup as sheets) to manipulate the formula’s, which will change to month from 1 to 2 and etc. I’m trying to use this concept to display data from different sheets. My project is current using this concept to display data on for each person and each month. I found out if I use the following formula below I can get data to display for month 1 for each person, but I can figure out what formula I need to display data based on the month as well. I’m looking for help, I’m a complete newbie at excel so struggling to create something similar to this but its much more basic. i need 1 list (data validation) which i worked out how to do, and i need it to extract information from 1 row. there are no duplicates, no multiple entries. just a simple drop down list that brings up a few columns of data in a row. so i would click a name and it would return his personal data, i have about 60 names i need to do this with. i really need your help with this. Yes this was exactly what i wanted. Thank you. I can see how you did it now. Thanks for this. It is an excellent tool. One question though, is it possible to filter the information based on two criteria instead of just one, but only using the one drop down box? Using your example, if someone was the sales rep for India and China, then they’d appear if either of those options were selected from the one drop down box. If so, how is this done? If not, what would the workaround be? Your help would be greatly appreciated. Thanks! Hello Sharmaine.. Try changing the formula to =INDEX($A$2:$C$21,$F2,COLUMNS($K$16:K16)). I believe you did not lock the range (A2:C21) which means that as you go down the row, it changes to A3:C22 and so on.. This is great, I was just wondering if there was an easy solution to having up to 100 rows of data, not just 20? AHHHH excellent, I was missing the extraction change in J4. This is the best tool ever. I have try all the formula including using the “All Country”. When I select “All Country”, it does show all the details but after the updated data It will show 0 instead of blank cell at the bottom. Love this model and want to build something that may be able to handle up to 76 columns of criteria!! E.g. if I choose (e.g. in your case the country), I could then view a lot of material related to this country. Also would it even be possible to put the countries at the top and the profiling criteria down the column? Thanks Keelin.. Glad you found this helpful. Thank-you the dependant drop down is an inspired idea and sooo very very helpful. 2. Look up a database of 1200 rows with 87 columns of data (this is a summary sheet) the first 3 columns will contain data relevant for our dependant variable choices. Also, since you have a lot of data, I recommend use helper column approach instead of formula (as shown in Formula Hack #17). My conundrum is how to base the population based on a drop down box selection of list titles. I can type in the name of the list, e.g. Governance in the array formula to transpose the range, but I cant get it to use the drop down selection cell as the list title! Do you think you could help? But its not very elegant to say the least ! If you have a better way do please let me know!! Yep but I just found a problem!!! The horizontal row I am transposing to needs to cover 7 columns. I’m nearly there but not quite! Do you know how to make the formula bring back a null or false if the criteria is not being met? is there a way to show all information? ie. I will add “All Country” in the dropdown list. Thank you so much! You are a great help.